A full size sedan in production from 2006 to 2001, the Buick Lucerne is considered by many as the last traditional Buick design. Created on the H Platform the Lucerne was designed as the successor of the Park Avenue. The first Super Ultra Low Emission Vehicle, the Lucurne is more than just elegant but powerful and efficient as well. 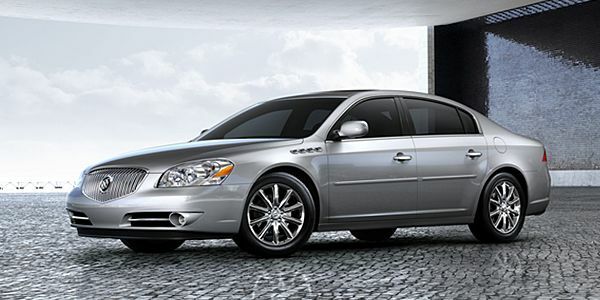 The Buick Lucerne is the more intelligent luxury Sedan. So if you need accessories or replacement parts for your Lucerne ordering from GM-Car-Parts.com is a wise decision. We sell only genuine GM parts and accessories and at wholesale discounts. Order over $300 and Ground Shipping is FREE*. Be sure to include your VIN when placing your order to ensure you get the right parts and accessories the first time. Just Named “Best Upscale Sedan for the Money” The Buick Regal has made a name for itself since it first showed up on the market in 1973. Since its beginnings, the Buick Regal has stood for sophisticated styling. Throughout its 5 generations, the Regal has continued to grow and change adding new and more luxurious features without the luxury prices. From style to comfort, the Regal is known as the affordable luxury sedan and remains in production today. Carrying parts for the Regal from 1988 – 2013, if you have a Regal and are looking to improve its performance or simple maintain it, you can find the parts here on GM-Car-Parts.com. GM-Car-Parts.com carries all available OEM Replacement genuine GM parts and accessories for your vehicle. From Cadillac to Pontiac, Buick, Chevy, Hummer, GMC or Oldsmobile, start browsing our catalog and find the OEM parts and accessories you need to keep your vehicle looking and running like new and at a price you can afford. Include your VIN when placing your order so our staff can make sure you are getting the parts you need the first time. First unveiled to the world in 2005, the Buick LaCrosse was produced as the successor to the Buick Century and the Regal. One of the more well known Buick’s in recent years, the LaCrosse continues to be one of its top sellers as well. For Buick’s, its all about luxury. From its ambient interior lighting to its simple convenience, the LaCrosse caters to comfort and the ride. Whether you are looking for parts for your 2005 or your 2013, GM-Car-Parts.com offers genuine GM OEM parts and accessories to keep your Buick LaCrosse looking and running like new. From wheels to engine parts, windows to seatbelts, find them all here and at wholesale prices. *Free ground shipping on orders over $300 as long as it is not oversized, overweight or shipped outside the continental USA.